This multipurpose craft has been updated over the past couple of years and is now nearing completion. She is similar to the Isle of Wight catamarans but her platform size is exceptional. She is a very fast and capable craft. Stable, strong, lots of dry storage and seating. Comfortable helm. Shallow draught. She has a very large deck space for only 15’3” hull length. 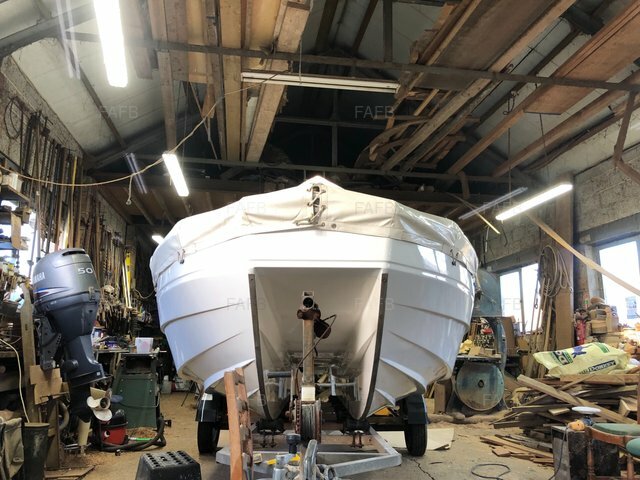 Her restoration is nearly complete and is being offered for sale prior to the outboard being fitted in case somebody wants to buy her and already has a preferred outboard to fit. Price is negotiable so please ring me to discuss. She comes with the tried and tested CMC power trim and tilt offering peace of mind for the outboard. There has been no expense spared during the restoration; gurit foam sandwich outboard well and seating, international two part poly spray paint job, new upholstery, Bailey marine deck hatches, enclosed conduit for easy routing of cables, she has a fully fitted tonneau cover, etc, etc. 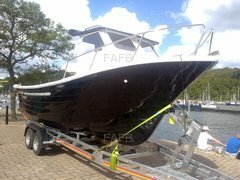 If you want to trail a boat for fishing with friends, or go diving, or moor a workboat in a harbour she will do them all. Thanks for looking and ring me with any questions. I will return calls.